After the Phoenix Four spent their way through a £427m interest-free loan and then toddled off with £40m in their back pockets, what was left of MG Rover was last year flogged off to Nanjing Automobile Group, for an undisclosed consideration. Meanwhile, around 6,000 workers were thrown on the dole, and about a third of them have still to find work. The picture left shows the last ever shift at Longbridge knocking off. 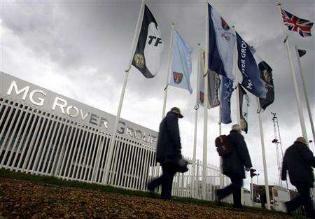 According to MG Rover’s administrator, the game plan at that time was to relocate the engine plant and some car production plant to China, while retaining some car production plant in the UK. Now - in an announcement that has caused widespread surprise - the Chinese company says it is planning to assemble and then market a new MG TF Coupe from a plant in Ardmore, Oklahoma, for sale into both North American and Europe. Another model, the MG TF roadster, will be produced in Longbridge, albeit in rather smaller volumes. Given the huge disparity in manufacturing costs between China and the US, one can only presume that Nanjing is getting one hell of a tax break here. This is globalisation in action. A brand name staggers from country to country, locating wherever it can extract the most generous financial backing from the public purse. And I suspect tax breaks might not be the whole story. I’d really like to know how little these new US employees will be paid if costs really are pared down to Chinese levels. My guess is that wages won’t even come close to those prevailing in unionised Detroit.